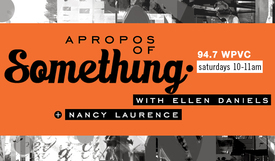 Apropos Of Something hosts Ellen Daniels and Nancy Laurence talk with A.D. Carson Ph.D., Asst. Professor of Hip-Hop and the Global South, McIntire Dept. of Music, on waking up to our place in history; and Max Luna M.D., Assoc. Professor at UVA School of Medicine, on cultivating a future generation of culturally sensitive healthcare providers.